First impressions count, people! 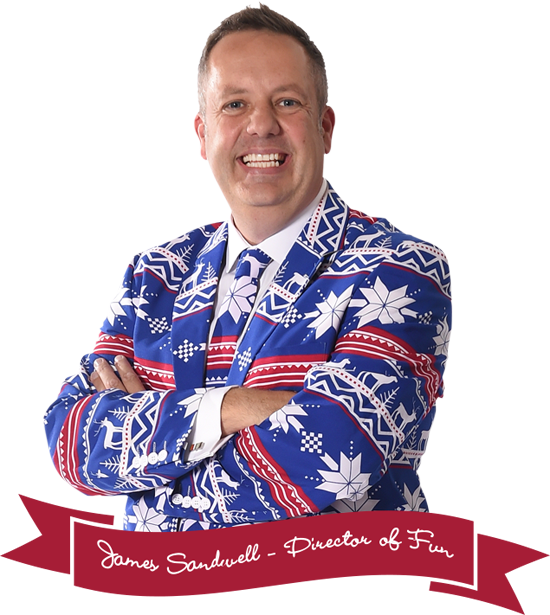 You don’t get a second chance to make a first impression, so when your guests arrive at your event, you want them to be astounded from the moment they walk in. So why not make that walk-in an event in itself? 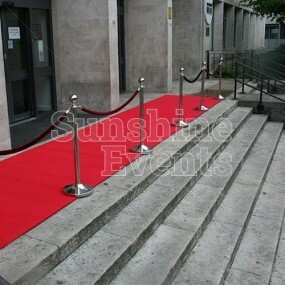 The Red Carpet Hire that we can offer is perfect for just that. 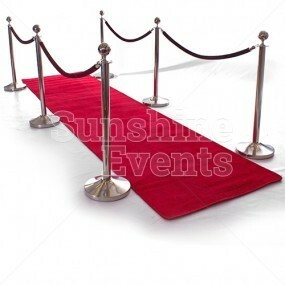 Available in 4m or 8m lengths, and bordered on each side by Red Velvet Ropes and Chrome Stanchions, it’s the perfect way to usher your guests into your event and give them the VIP treatment that they deserve. The carpet itself is of the highest quality, bound along the edges for a luxurious look and feel. Speaking of VIPs, you might have a guest of honour that you want to announce to your event, so having them enter on the Red Carpet walkway will be the perfect way to make them feel special, be it at their Birthday Party, Retirement, Anniversary or Wedding. At Corporate Events you’ll want to give ALL your employees the special treatment, of course! 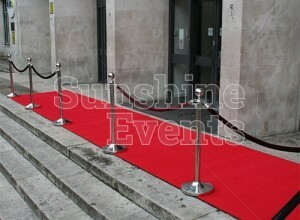 Turn your event into a real showstopper with the Red Carpet Hire and make that first impression last. You can rest assured that all equipment you hire from Sunshine Events is of the highest quality, cleaned and maintained by us in our depot (the Fun Factory!) and, as you can see by the pictures in our galleries, they look amazing at events. It’s due to our 10-plus years’ of event experience that keeps us striving for excellence, both in our equipment and the quality of service that we offer. To put your mind at ease, health and safety is of the utmost importance; we hold £10 million in Public Liability Insurance, and Risk Assessments and Method Statements are available to download from our website. Everything has been considered and accounted for, so there’s no surprises. Cast your eyes across our CustomerSure feedback and you will be able to see that Sunshine Events is a company that fosters a relationship of trust with all of its clients. That’s why people come back to us time and again!